59 days until my qualifying marathon. 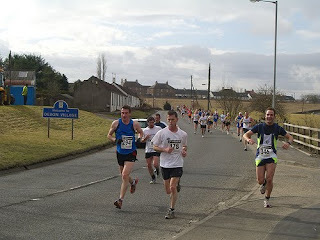 This past weekend I ran the Alloa half marathon. On Sunday, the day of the race, I woke at 7ish, and had my usual breakfast of muesili and coffee, plus an oatmeal cookie for extra calories. I left for Alloa before 9, and arrived at 9:15. I parked near the starting area, and walked to the sports hall where runners picked up their numbers. I picked up mine, affixed it to my shirt, and attached my chip to my ankle. I went back outside and jogged around the starting line a bit. I had arranged to meet my friend, M., at the start at 9:45. He arrived, but still had to pick up his number. I continued warming up until the marshall began getting everyone to the start area. The weather was good. Partly sunny, cool, little wind. I lined up towards the front of the 977 runners for the race. I talked to one guy who was hoping to run under 1:50. We wished each other luck. At 10:00 the gun went and we were off. I wanted to start out easy, and run a steady pace. The first mile wound through the small town of Alloa. 6:24. This was way faster than I'd planned. I tried to ease up. Mile 2, still in town, was 7:04. This was much more like the pace I wanted to run. One guy running near me appeared to be working really hard, breathing loud, and apparently going all out. Mile 3 included a climb and came in at 7:22. Surprisingly, in this mile, I'd seen two runners stopped at the side of the road. One appeared to be stretching a cramped leg. The other was bent over and breathing hard. 4 had a downhill, and came in at 6:54. The miles thereafter started to blur together in my memory. My 10k was in 42mins something. This was better than my 10k time in my most recent race of that distance. I tried picking off people one at a time. One of my splits in these middle miles was 6:12. I have to assume I made an error in the using my watch, or, worse, one of the mile markers was misplaced. Mile 10 or 11 included a good climb back to Alloa. I was tired, but running with a guy who had a consistent pace. He pulled ahead on the hill, and an old guy wearing a head-band chuffed passed. After the climb, the road descendend a bit, and I passed the old guy again. Mile 12, as usual, seemed incredibly long. I was back in town now, and even though I knew it was the last mile, I couldn't push harder because I had a side-stitch. From last year's race, I recognised the final corner leading to the finish line and started sprinting. I passed one guy, but another runner came sprinting up behind me. He drew even for a second, and then I went just a touch harder and crossed the line in front of him. We shook hands after crossing the line. My official time was 1:30:55, a personal best. This put me in 177th place. I'd shaved nearly five minutes off of my time in this same race last year, and nearly three minutes from my previous half marathon best time.